Experts tell us not to. They recommend a darkened room, peace and quiet, and an ambient temperature on the cool side. Remove the radio, digital clock and cell phone from the night table. Banish the handheld electronic device, whose tiny flickering screen plays havoc with the brain. The hardcover classic with the clip-on light? Forget it. Books and magazines make you associate bed with information and comprehension, they say. Bed is for sleep. If you wake in the middle of the night, get up and do something. After an hour or so of moderate activity, go back to bed. I tried that. The next morning, elves had washed and put away a sink full of dishes and scrubbed the kitchen floor. I still felt tired. Now, when I wake in the hours before dawn, I lie on my back with eyes closed. Motionless as a funeral effigy, I drift between conscious thought and dream. An idea floats by, then more ideas. I watch the stream with interest and a touch of excitement. Will I remember any of this in the morning? Should I sit up and take notes? Sooner or later, sleep steals upon me like a Native American scout, and his knife sends me to oblivion. Years ago, I heard a bell ring or a voice call my name. I woke hot with panic. My heart pounded. I threw off the covers and leaped out of bed. In much the same way, a voice rouses young Samuel from sleep in 1 Samuel, Chapter 3. This happens three times, and the priest Eli realizes that the Lord has chosen Samuel. In my case, the hallucinations stopped. But I still wake at night, and my lazy ways do not always succeed. When that happens, I prop the pillow against the headboard, rise on one elbow, switch on the bedside lamp, and reach for the book I was reading when I went to bed. Because it is impossible after a day crammed with sights and sounds, sensations and words, to renounce life so suddenly. Often, I fall asleep after a page or a paragraph. An hour later, I find myself still propped on one elbow, the lamp still burning, the book still open, and my fingers splayed on the page to hold it flat. Before the sleepy haze can dispel, I clap the book on the night table, switch off the light, and burrow under the covers. That usually does the trick. The book is there until I need it again. The author waits with superhuman patience. The interrupted voice will resume where it left off, as soothing as a psychiatric nurse. It is only natural in this situation that my reading should affect my dreams. What is strange is that it works the other way around as well. As evidence, here is a dream recorded in my journal. I had gotten a note from a magazine editor signed “Ed,” which I mistook for his name, and I had looked up the definition of the word “canon,” which derives from Greek, meaning a rod or rule used by a mason or carpenter. I enter a house to meet someone. We are to travel together or simply walk somewhere. I go into a dark room, possibly a bedroom, but the darkness is so thick that I see no furniture, no walls, nothing at all. Who am I looking for? The name Ed comes to mind, so I call it. There is no sound, no clue that anyone is present. I say: “What’s the matter?” and “Tell me what’s wrong.” Silence. Sensing danger—a steel rod or sword comes to mind—I retreat to the entry hall. Without a word, a young man carrying a briefcase exits the room and the house. I reach for him, but I am slow and clumsy. I catch up, but I fail to grasp him. We run uphill, the young man slips and falls, and I think I will surely get hold of him, but he scrambles free. At this point, I wake. I have always an idea in my mind, a certain confused picture, which shows me as in a dream a better form than I have used, but I cannot grasp it and develop it. And even this idea is only on a middling plane. From this I conclude that the works of those rich and great minds of ancient days are very far beyond the utmost stretch of my hopes and imagination. The image struck me. Was I trying to grapple an editor or an idea? I was literally in the dark, then chasing, then unable to grasp. What was in the briefcase? Papers, of course, or something hidden. The answer to my question? In other essays, Montaigne discusses the program of his literary work, a minute examination of himself. A little farther in this essay, I chanced on the following. Those who would divide our two principal parts, and isolate one from the other, are in the wrong. On the contrary, we must reunite them and bring them together. We must command the soul not to draw aside and hold itself apart, not to scorn and abandon the body—which she can only do by some false pretense—but to ally herself with it, help control, advise and correct it, and bring it back when it goes astray; in short, marry it and become its partner. Dreams fracture the self to make their point, and persons who appear in them, like characters onstage, are often merely aspects of the dreamer. Asleep, we are all egomaniacs. In Montaigne’s terms, maybe I was a body chasing my soul. It is a small step from wrestling to embracing. I have woken from a dream of one or the other to find my arms wrapped tightly around my chest. Was I chilly? Was I straining to reunite? As it happens, I have lived most of my adult life alone. Does the dream-hug signify unrequited love or a desperate longing for company? Maybe it is a wish fulfillment, as in Shakespeare’s Sonnet 87. After listening to people who have been married for many years talk about their aloneness, as in a novel by Albert Camus or Gabriel Garcia Marquez, I now think something else is afoot. 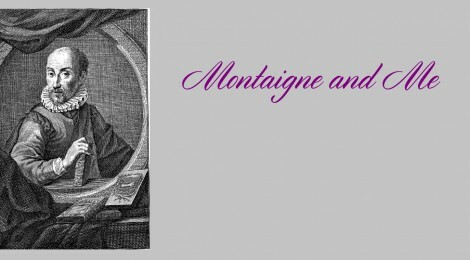 Did Montaigne have the same dream, and did he write the essay in part to make sense of it? He was the owner of a landed estate and a person of note in sixteenth-century France, a courtier of Charles IX and the mayor of Bordeaux. Married, he seldom mentions his wife. He often mentions his friend Étienne de la Boétie, whose death in 1563 affected him deeply. In the Essays, de la Boétie becomes the ideal companion, the paragon of friendship, the other self. It would only be natural to dream about him. With his gift for metaphor and suggestive parallel, Montaigne is far from the naked truth-teller that critics make him out to be. William Hazlitt, an English essayist in the nineteenth century, describes Montaigne this way, but he could be describing himself. He wrote not to make converts of others to established creeds and prejudices, but to satisfy his own mind to the truth of things. In this respect, we know not what to be most charmed with, the author or the man. There is an inexpressible frankness and sincerity, as well as power, in what he writes. . . . He does not converse with us like a pedagogue with his pupil, whom he wishes to make as great a blockhead as himself, but like a philosopher and friend who has passed through life with thought and observation, and is willing to enable others to pass through it with pleasure and profit. A champion of the French Revolution; a foe of lies and cant, the hypocrisy of English society; blessed with acute self-awareness but notoriously thin-skinned; innocent of irony, Hazlitt runs to extremes: a prize fight, an Indian juggler, an obsessive love affair. He is all enthusiasm, while Montaigne sticks to the golden mean. But both, it seems to me, make intuitive leaps rather than reasoned progress. Reclining under the bedcovers, apt to doze in the middle of an argument, I read untroubled by gaps in logic. In books I only look for the pleasure of honest entertainment; or if I study, the only learning I look for is that which tells me how to know myself, and teaches me how to die well and how to live well.